Like Howie Long, have you been enviously coveting the 2009 Ford F-150's man step? Now, thanks to the Truck N' Buddy, you can have a similar feature on any pickup of your choosing. Despite Chevy's overt inquiry into the sexuality of any man step-using Ford driver, a tailgate step sounds like a great idea to our admittedly feminine minds. Hopping in and out of the increasingly lofty beds of trucks while carrying heavy loads can be a difficult and dangerous task. The step goes a long way to removing risk, all while providing easier access for pets, kids and little people. Bringing Ford F-150-like practicality to a small, more practical, efficient vehicle just sounds like a win/win situation to us. More info in the press release below. 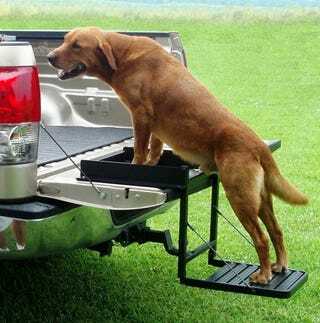 The Truck 'N Buddy is a tailgate step that doubles as a seat. This 16-pound aircraft aluminum unit stores by hooking on the tailgate. When unfolded, the Truck 'N Buddy is a bed step for aging pets — and aging truck owners as heavy as 300 pounds. It also functions as a seat for tailgating, sporting clay shooting, camping and even for changing golf cleats. The platform is supported by 1,700-pound test cables and has traction ridges for sure footing. A handy grab-rail promotes safe stepping. Made in the USA, the Truck 'N Buddy is finished in durable black powder-coat enamel. MSRP is $179.